The Scientist has entered the year 2000! This is Scientist McGee, and I’ve never really even read a blog until about a week ago. That was when my wife started her own blog chronicling her foray in to running an online business. So since I want to read hers, I figured, well… I’d better see what all this blogging stuff is that I’ve been hearing about for the last decade or so. Supposedly, there’s millions of DIY journalists out there making more of an impact on the opinion-sphere than the traditional CBS’s and Newsweeks of the world. That’s pretty cool and all, but I don’t have the time nor energy to create anything right now legitimate enough to expect the “public” to follow or learn any credible information from. Instead, I think I’ll try this thing out as sort of my own journal. I’ve never been a journal keeper in real life, nor do I really want to begin one now in an online version. But the one topic of information I was curious to seek out once I created my WordPress account was cocktails and the world of mixology. This is something that I am obsessed with right now. I say right now, because my obsessions do tend to change over time. But right now I can’t read enough about cocktails and I tend to spend all of my money on cocktails… bottles of liquor, glassware, mixed drinks at bars, etc. I used to spend all my money on records, then I spent all of my money on comics, now I spend all my money on spirits and fun spirits-related things. My obsessions change, but that’s not to say my tastes change. Once I become obsessed with something, that thing will always be something I love. It’s just that once I’m no longer obsessed, it’s filed away in to the reserves of my interests and loves. I can’t be truly obsessed with something forever, because my obsession can only occupy that much time and interest for me if there’s mountains of new information that I don’t know about and am excited enough to absorb in large quantities. I obsessed over records until there wasn’t enough old music that was new to me to occupy that much time being spent on it… Now I just love music and buy records at a more “normal pace”. The world of comics was new to me a few years ago, so there was decades of stuff that was new to me, so it kept me occupied rummaging through it all and finding out what I liked and what I didn’t like. Well, now I’ve found some favorites and now it’s nice to slow down as new stuff is made and I can discover a new thing here and there, a little bit at a time, and now I buy comic books at a “normal pace”. So with I think around $75.00, I went and got some basics… I had the gin, so I added a bottle of rye whiskey, rum, vodka, dry vermouth and some Kahlua. I’d never really drank liquor, so this was a new world to me… and I loved it! This was last summer I think? (it’s hard to keep track of time) Early last summer if I’m not mistaken? And now I can’t get enough, and am slowly building up my bar with some more “obscure” stuff like Campari, Peter Heering Cherry liqueur (which may be my best purchase to date! ), and I’m really excited today, because as of next Friday, I’ll have saved up enough “fun money” to buy a bottle of green Chartreuse! This will be the most money I’ve ever spent on anything that’s consumed – my local spot’s got it for $55.00. To date, this is the equivalent of the record I had spent the most money on – $45.00 on a 45 of Johnny Cash singing “Ring of Fire” in spanish… ha! ha! 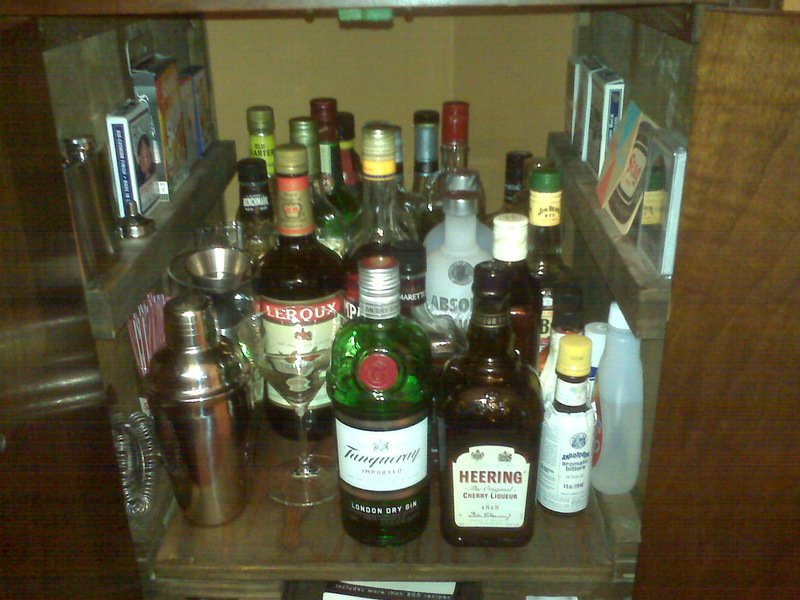 But yes, now I spend all my “fun money” on building up my home bar. Today in fact, my wife and I went to an antique mall and I spent $9.50 on some cool old glassware – 2 small cocktail glasses that will be perfect for drinking the Chartreuse neat, 1 fancy kind of crystal cocktail glass that’ll just be fun for any fancy cocktail, and then 1 fun glass with a green thick base/stem that’d be good for fancying up an “on the rocks” drink instead of using just the old fashioned glass. I’ve got a few different nice sets of glassware that all match for regular day-to-day drinks with guests – I’ve got some cocktail glasses, old fashioned glasses and some champagne flutes. Those all do the trick and are the perfect glasses for functionality. 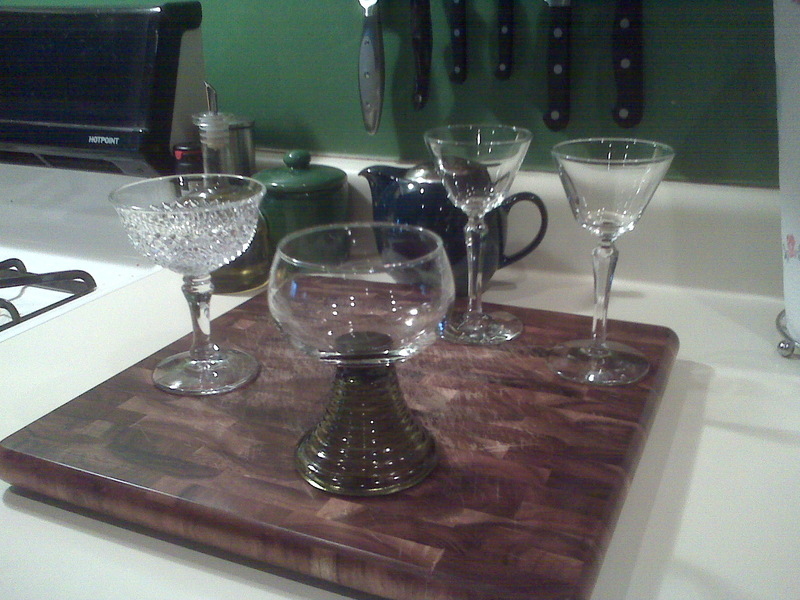 Now my interest turns to building up an eclectic mix of glassware comprised of individual one-of-a-kind glasses. Hense the $10 shopping spree at an antique mall today. I can’t wait to use one tonight! So anyways, next week is me getting my coveted bottle of Chartreuse… I’m pretty excited! I’ll try and chronicle my booze journey, with this blog, as I learn about and love the spirits! Also, for the past few months, I’ve made it a habit to take a picture of each new drink I try making at home. So I’ve got a few pictures of those too, that I’ll try and post and talk about a little too. So… this is the introductory blog to my “Travels Through the World of Spirits” chronicles! 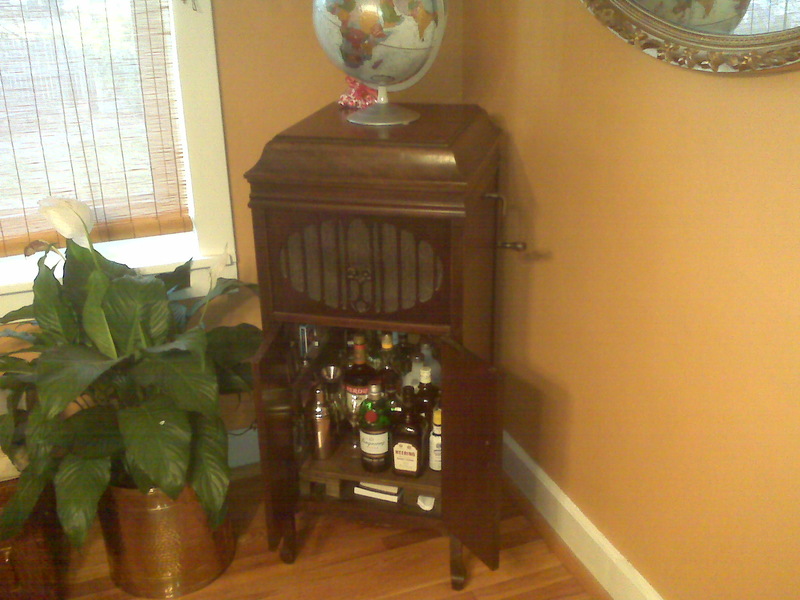 I still think the victrola is the best idea for a bar ever! (and you know how I feel about the victrola….) I can’t wait for you to make more drinks tailored just for me!